Category Archives: Hartford City F.C. 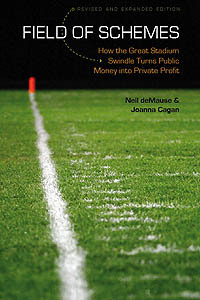 Among the transactions under law enforcement investigation are a check for more than $13,000 that Premier Sports President Mitch Anderson wrote to himself for “legal fees” in October as the enterprise collapsed, and a $120,000 bank transfer in August to James Duckett, the owner of Black Diamond Consulting, which merged with Premier Sports months earlier. The bank records include several other five- and six-figure transfers to Anderson, Duckett and others, The Courant has learned. Duckett, if you’re scoring at home, is the guy with the felony embezzlement conviction on his record, and at this rate he may be headed for another one. Meanwhile, Hartford City F.C., the new indoor soccer franchise that was supposed to transmogrify into an outdoor soccer franchise through this deal, is now not a soccer franchise at all after the Major Arena Soccer League booted them out for the 2015-16 season. Among those who are being stiffed on payments, according to the Hartford Courant, are several players and a 20-year-old college student who never received her final $410 paycheck. It’s tough to imagine how this scandal could get any worse, but I wouldn’t want to bet against it. Posted in Hartford City F.C. The president of the Hartford city council wants city development director Thomas Deller fired, saying he approved more than $735,000 in inappropriate payments to the would-be stadium developers before the project was killed when it turned out one of the owners was a convicted embezzler. A Field of Schemes reader who obtained some of the invoices submitted by the developers has forwarded them here, and they are hilariously unspecific: If anyone can figure out what was actually paid for here, aside from some test borings, you win a prize! But then, we are all winning a prize every day, which is the most entertaining sports ownership scandal since the time Nashua, New Hampshire evicted its minor-league baseball team for failure to pay rent by parking a tractor on home plate. Though Hartford still has time to top that one if it really works at it. The Hartford city council put an official fork in the city’s already-dead soccer stadium plan yesterday, formally withdrawing its proposal to lease stadium land to developers who it turned out included a convicted embezzler and a guy who’s allegedly been billing the city for more than a million dollars without doing the required work. “This fiasco, it is a black eye for the city,” declared council president Shawn Wooden unnecessarily. I am hopeful that we will find out where the vetting was in excruciating detail, now that we progress to the finger-pointing stage, and eventually the throwing-people-under-the-bus stage. Seriously, this is going to be so much more entertaining than minor-league soccer ever would have been. Great news, everybody: The guy with a felony embezzlement record who wanted the rights to build a Hartford soccer stadium is out of the picture, because, okay, what part of the start of this sentence didn’t you understand? Less great news: His partner in the project, Premier Sports Management Group, may have taken more than its allotted share of city money for the project by … well, it’s up to a court of law to determine what counts as “embezzlement,” right? The Hartford police major crimes squad is investigating the company’s billing, and separate inquiries have been launched by the city’s internal auditors and the city council. Deputy police Chief Brian Foley said Friday that the department has also notified the state’s attorney’s office and the U.S. attorney’s office in Connecticut. I know this is about a stadium for an MLS team that will never exist, but it is officially the best story ever, so I vow to keep you posted with further updates.